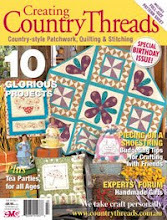 Hi everyone, I thought I'd give you a little sneak peek of my new project for 'Country Threads' magazine. I'd like to share with you a gorgeous recipe sent to me by the lovely Maureen from CrazyQstitcher. I made these scrummy little puds over the weekend. They would be great to take along to a Christmas celebration. You could make some of these now, and pop them in the freezer, as you know how hectic christmas time can be. Crumble the fruitcake, heat enough alcohol to moisten and flavour same. Melt dark chocolate and stir into cake. Both alcohol and chocolate need to be hot so the chocolate does not set. Roll into balls and decorate with melted white choc and tizz up with green and red for holly. (I used some christmas sprinkles - holly leaves and berries). If you put your index finger to thumb, this is the size of the ball. Green/red cherries cut into little bits are good for holly leaves, ...or lolly snakes, jubes not rolled in extra sugar are okay too. Puddings are very rich and will freeze. This is the picnic quilt that I wrote about, two posts ago. It is called 'Flowers for Thee' by the Chook Shed Pattern company. It is coming along. And it is a great portable project. I will re-arrange the blocks around when it is time to piece it together. It was my MIL's birthday last week, so I thought I'd make her a basket, and fill it with some home baking. I whipped up this cute little fabric basket following Pink Penguin's tutorial - very easy - I will make some more of these. Then filled the basket with some little iced gingerbread men and stars. 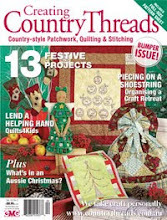 I went to the Brisbane Craft & Quilt fair recently, with some of the gals from the quiltgroup. I didn't buy much really, but I had a great day out looking at everything. One of the fabrics I bought. It is Japanese and printed on both sides. There is the cherries/braid/strawberries on one side, then the blue check/polkadots on the other. Hubby gave me an Angus & Robertson bookstore voucher he had been given, lucky me. Whilst looking in the bookstore, I found this lovely book, Material Obsession two, full of inspirational quilts. I have started working on another quilt - 'Flowers for Thee' by the Chook Shed pattern company. I found this (old) pattern in a magazine, at my quiltgroup's library. It has a lot of tartan fabrics in it. I will be able to use up a stash of tartan pieces that I have had for a very long time. The quilt is made up of a four-patch and an appliqued block that has a simple basket and heart on it. I think it will make a nice picnic quilt.